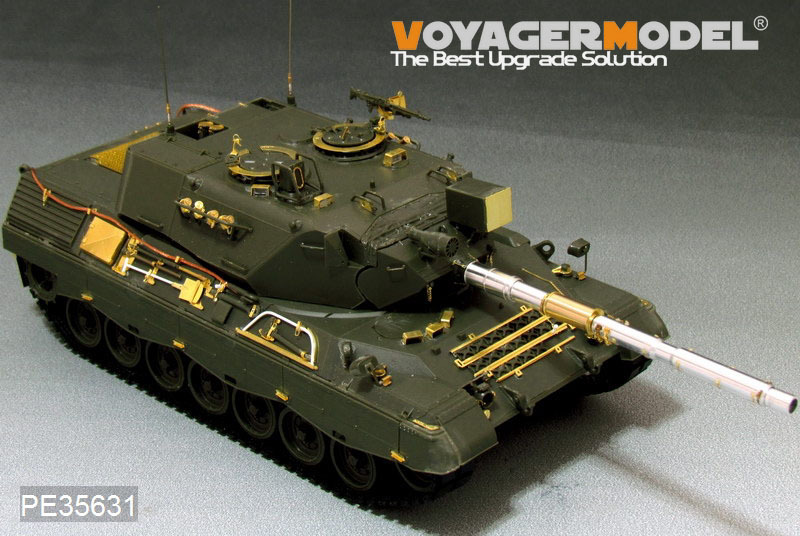 Voyager Model are a Chinese company producing high detail after-market kits for various models. Their range is huge and covers everything from aircraft to tanks. 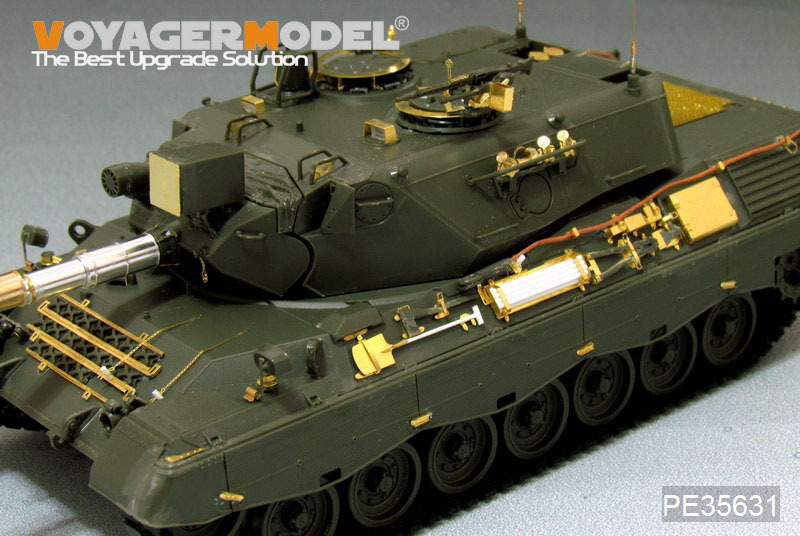 Though delivered in small boxes, their kits are massive and provide great detail and accuracy to any model. This kit is a good example of a Voyager kit. In a 10 x 10 cm box, they have cramped 8 sheets of photo-etch, 4 pieces of plastic rod, 1 metal rod, 2 sets of antenna springs and antenna top sockets, 8 brass smoke dischargers, 2 copper cables, a 5-piece turned aluminium gun barrel and 4 pages of double-sided instructions. 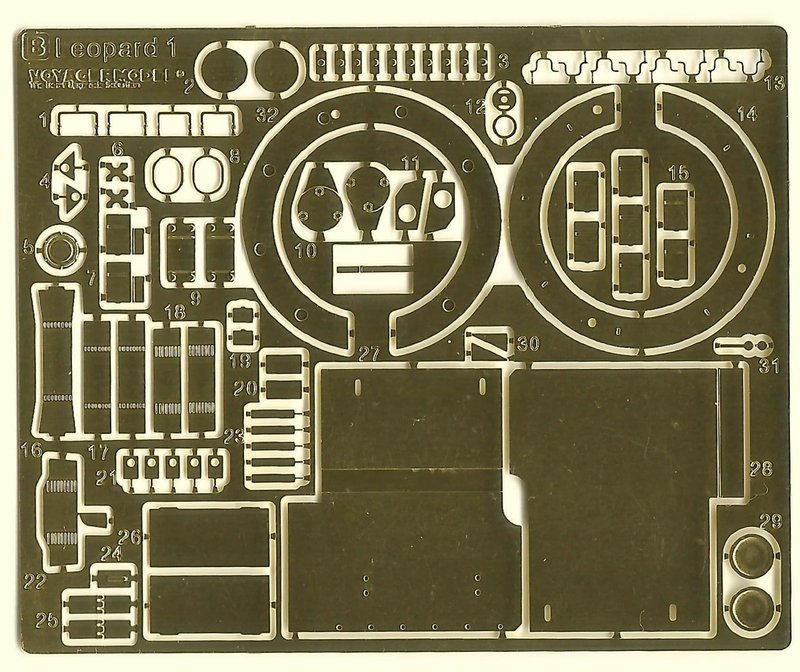 The kit is intended for Meng Model'ss TS-007 German Main Battle Tank Leopard 1 A3/A4. I do feel, however, that most of this kit will also fit the Italeri/Revell models. I have tried the gun barrel and it required only a small adaptation to the mantlet. The screens for the rear deck, however, will take some adjustment to adapt. But, all in all, I think it's safe to say that this set can be used for Italeri and Revell Leopard kits, too. Sheet A is mainly parts for mounting the tow cables. All fixing points can be changed to much more detailed PE ones. This really is an improvement over other PE sets I have seen. It also includes wheel masks for both the road/idler wheels and the smaller return rollers which, again, is a nice thing to add. 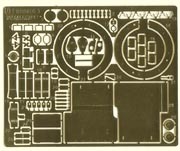 Sheet B provides you with detail parts for the periscope shields, the rear mud flaps and some details for the hull top. There are also parts for the cupola rings which will make them more true to detail and thickness. Sheet C gives you more than 100 parts to update and detail the hull. First and foremost, this includes high-detail tool brackets - nothing new in this, except for the level of detail. It also includes true-to-scale hollow toolboxes, but they have no internal detail. The handle on the rear tool box will need some adjustment to make it correct - the provided parts has the handle sitting flat on the box, when it should be raised up above the box. Sheet D has screens for the NBC filter and the engine intake which for some odd reason is manufactured in stainless steel whereas all the others are made in brass? Sheets E and G are details for the smoke dischargers and the gun sleeve brackets. Sheets H and I (2 pieces) provide parts for the gun and two screens for the rear deck. 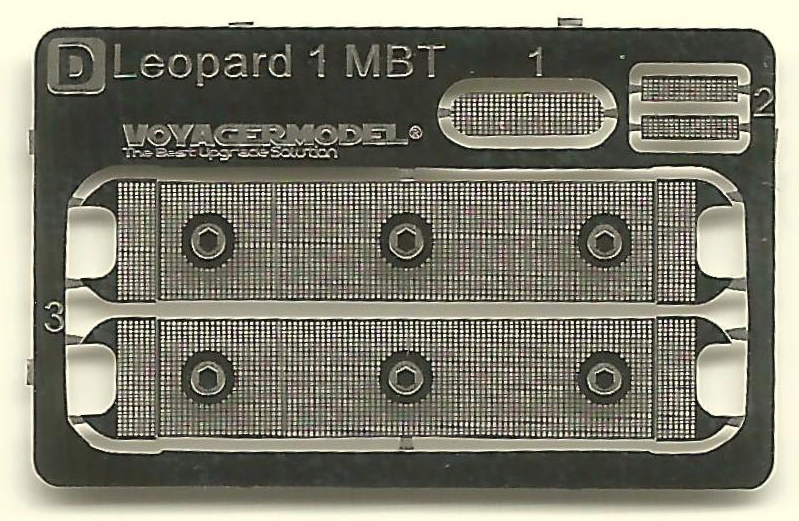 If you build a Meng Leopard, I wouldn't use the latter parts. It is true that the rear deck fan is covered in two layers of grilles. However, the lower one is a rather thick casting with only the upper layer as a wire mesh. The shape of the rings on Sheet I is incorrect anyway - they are not circular. 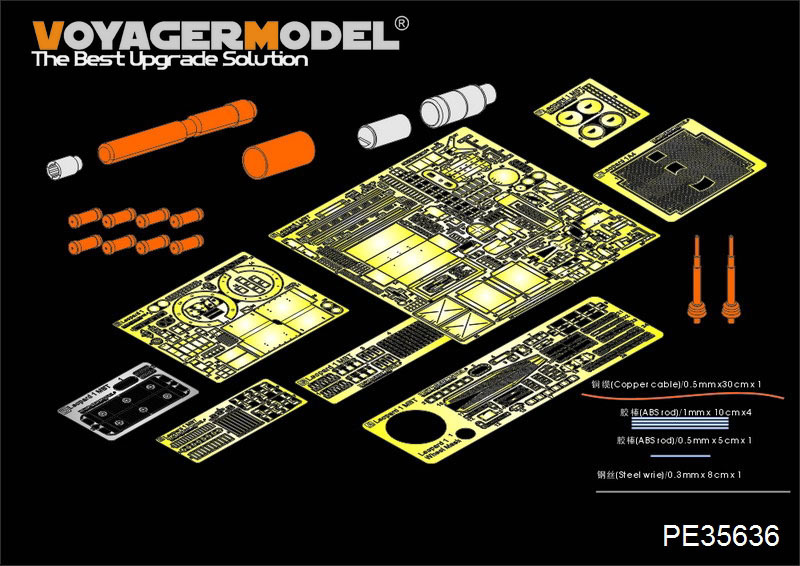 The parts in Meng's kit will provide a better impression of this as supplied in the kit. 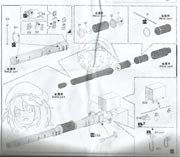 The gun is broken up into five parts: the muzzle end, the forward thermal part, the fume extractor, a part of the exposed barrel and the thermal part up to the mantlet. Finally, you get 8 brass smoke dischargers, parts (spring and end) to make two antennas mounts, some copper wire for the cable and some plastic and metal rod. 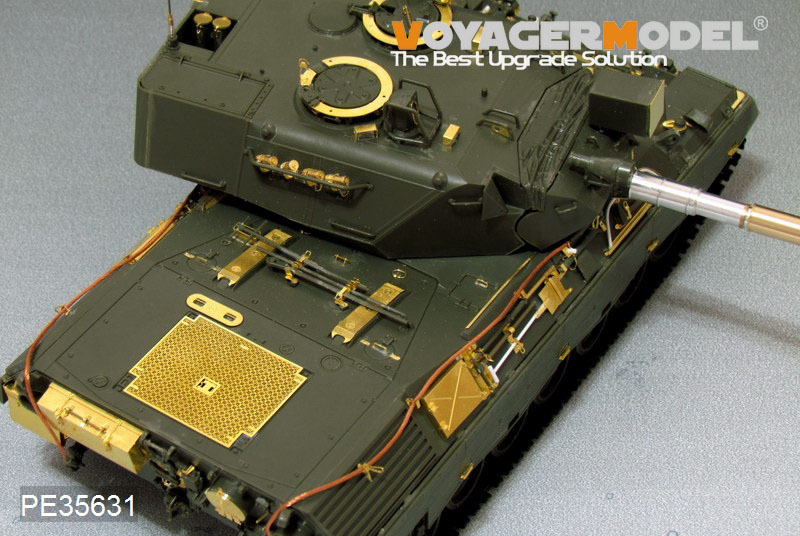 Altogether close to 200 extra parts for your Leopard! Before passing a verdict on this set I would like to make a point first. I build kits - I don't collect kits. This means that no matter how good a kit looks, I still think it is more important if I can build it. So the important things are, is it accurate? Are the instructions any good? 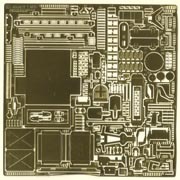 How is the fit of parts? Is the time spent building it worth the effort? In the end, is the kit worth the price? One of the main features of this offering is the barrel, and this fails miserably. In the photo below, the first number is the scale diameter calculated from my measurement from a real Danish Leopard 1 tank. The second is the Voyager size. As this shows, just about all diameters are too small apart from the end of the barrel - and this is too big! The diameters up to the muzzle are too small by 10-15%, whereas the muzzle is too big by 25%! This makes the general impression of the finished gun way off. Sorry Voyager, but this is unacceptable. Length-wise, it is okay though. The smoke dischargers seemed to have a similar problem. However, they turned out to be bang on with my measurements. They are very good and understandable all the way through, as this scan shows. The printing is a bit unclear, but altogether - good job here, Voyager. 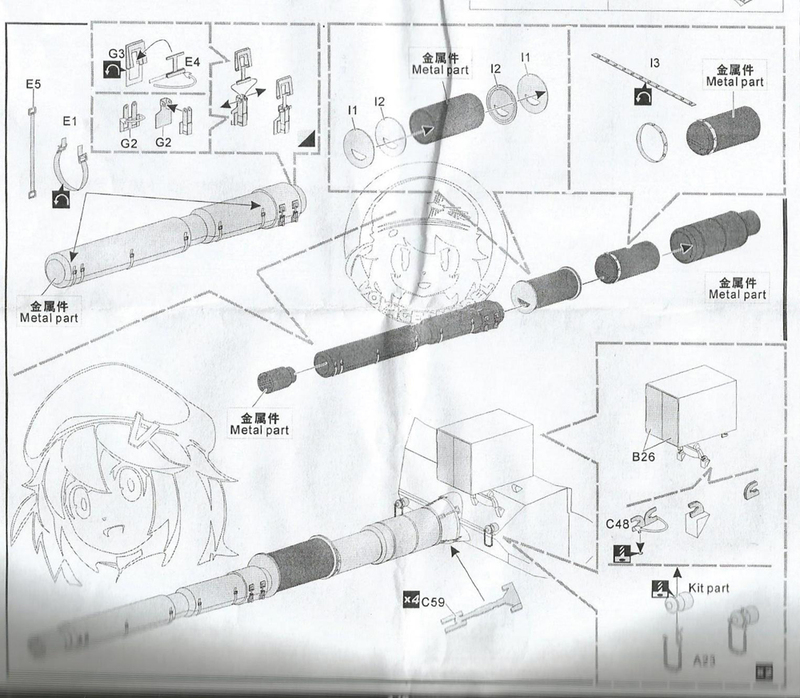 As the above illustration shows, and as previously mentioned, the barrel is split into many parts. For this to work, the accuracy must be high. Sadly it is not. The sloppy tolerance of the assembly pins and holes makes it all a tricky build. You really have to take great care to get the barrel straight. I built up one of the smoke dischargers and this was bang on all way through. The other parts do not demand the same degree of tolerance, so I presume they will not cause any problems. All the parts for the tool brackets and added details are definitely worth the effort. It will add extra hours to your build, but it will be worth it. You will end up with better smoke dischargers too. However, I doubt I will use them. They take far too long to build, and there are better offerings in one-piece cast resin (I recommend ET Models). The barrel - well-? The barrel lets down an otherwise very good set. They have taken Meng's two-piece plastic barrel and made a metal version of it. What a shame they didn't make the effort to seek information on it and make an improved version of it. And basically this is the disappointment with this kit. 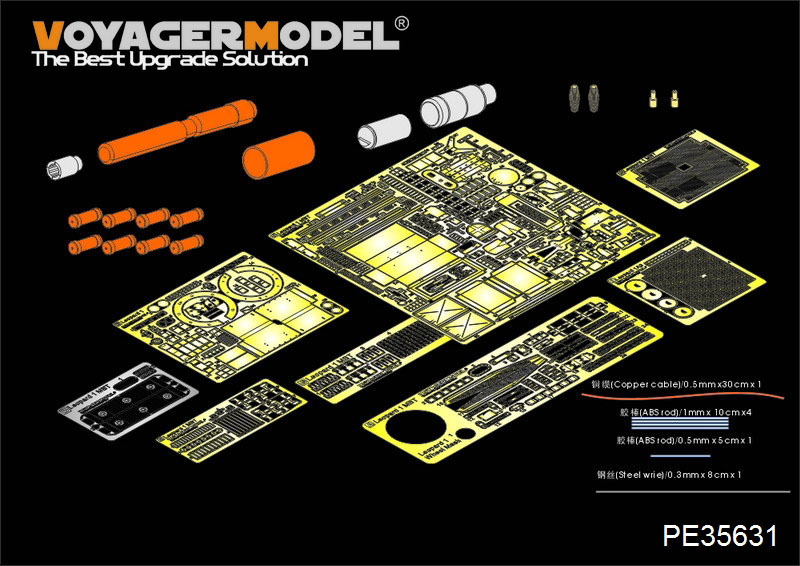 This is not a kit that will improve your kit, it merely updates and super details it.